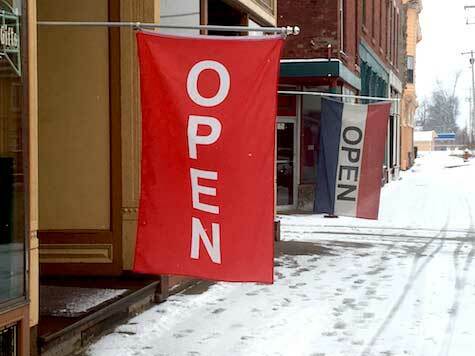 Photo by Tom Rivers: Open flags are outside the Uptown Browsery in downtown Albion in this photo from last month. Sales tax in Orleans County grew by nearly $500,000 in 2018, part of a trend around the state. However in Orleans County the rate of growth, at 2.92 percent or $475,614, was among the lowest in this part of the state. Of the 14 counties in Western New York and the Finger Lakes, only Monroe at 2.38 percent and Wyoming at 1.81 percent had lower growth rates. Sales tax revenues jumped by $1 million for Orleans County in 2017, up 6.45 percent from $15,287,529 to $16,273,192. The county budget for 2019 is counting on additional growth of $560,000. The sales tax increases have helped the county pay for infrastructure projects and also stay under the state-imposed tax cap, which is usually about 2 percent a year. Sales tax collections across the state came in at $17.5 billion, which was up by $872 million or 5.3 percent, according to a report from State Comptroller Thomas DiNapoli. Among the rural GLOW counties, two had robust growth while the other two had a modest increase. Genesee County’s sales tax grew by 9.00 percent, from $38,683,226 to $42,163,430, and Livingston went up by 9.12 percent from $31,880,449 to $34,788,736. Orleans grew 2.92 percent, which was more than the 1.81 percent for Wyoming County, which increased from $18,262,292 to $18,592,593.